1 can of gloss black paint. 1 can of clear coat paint. 1- Model type small paint brush. 1 package of small head 1/2" sheet metal screws. An appropriate drill bit for the pilot holes of the 1/2"screws. A pack of the finest grain wet /dry sandpaper you can get. 2nd- Make a template of the tail lights with a piece of card board. If you don't have the power hatch release option now would be a good time to mark where the hole for the key goes. 3rd- Transfer your measurements from the template to your Plexiglas. 4th- Cut out the Plexiglas to the shape of your template. Be sure to cut out a trunk key hole with a hole saw if you don't have the power hatch release option. 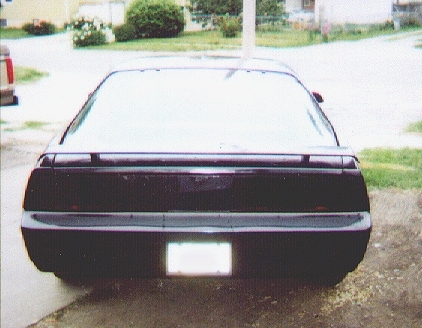 7th- Recoat the painted surface with the clear paint to prevent the black paint from scratching when installed on the tail lights. 9th- Paint the heads of the screws with black paint to blend them in.